So I still have to do my airbrush review on the new compressor style (thanks to the holidays, sickness, and my Dad being admitted to the hospital with heart failure I've been behind on everything). I have to say I love the changes in the compressor from the old one, it's a huge difference in how quiet it is now compared to the old model! I love the fact the airbrush makeup looks great and like my own skin and that I can build it up without it feeling like a mask. 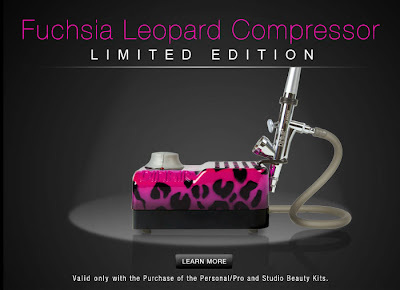 Anyway right now Dinair has a Limited Edition Fuchsia Leopard Print Compressor, if I didn't already own two of them I'd for sure be purchasing this! I was actually considering buying it anyway because it's so cute! Also if you haven't checked out their site they currently have a payment plan to make it easier to purchase! The payment plan breaks the balance of the kit into 6 payments over the course of 6 months! So if you've ever wanted a kit but just can't shell out the full amount right off this is definitely a great way to purchase one. Hi there, I found your website by the use of Google whilst looking for a similar matter, your site got here up, it seems to be good. I've bookmarked it in my google bookmarks.